Fix Your Acne Issues With The Best Blue Light Therapy Devices! Light is crucial to our sustenance. All of us know this fact. Plants, animal, human beings…..all of us need it. We always allude sunlight to our health when ever the subject of light is discussed. Is it the only health rejuvenating beam available for us? Have we ever thought that apart from sunlight other natural lights are available? and do they confer any health benefits? What we ought to know is, that when light is split it produces several monochromatic lights (light of a single wavelength and hence a single colour).. We all have studied in school that light is a mixture of different colours that make up the spectrum of white light. Of late science has discovered benefits of monochromatic lights in health and healing. One of the break through is ‘blue light’ and its effects on our skin. In the year 2000 independent research by the Imperial College of Science Technology and Medicine at Hammersmith Hospital in London determined that 15 minutes a day of light therapy provided an effective method to cure mild to moderate acne. In October of 2002 the American Academy of Dermatology published that “Light gets at the core of what causes acne eruptions: P. acnes, the bacterial responsible for causing acne inflammation, pumps out tiny molecules called porphyrins. We bring to you, a list of Blue light devices that you can trust and use at the comfort of your home and get clear and radiant skin! A trustworthy product from the company ‘Baby Quasar’ uses blue light to prevent ‘breakouts’ and kill blemish causing bacteria. It is a hand held device ideally designed for acne prone skin. Science proves the healing power of blue light and so this device too will rebuild your belief in this as you will see manifest results for yourself. A medical grade device that will provide results obtained by visits to any top notch dermatologist. No ultravoilet radiations emitted, so quite safe to use. Unlike the use of any topical product, this will provide lasting results. You don’t ned to look back at all since the effects will last for months together, requiring only occasional maintenance. Robust as well as aesthetically designed. It is made of high quality anodized Aluminium. You will avail a 90 days money back policy with the product. Hassle free customer support provide with the equipment. USAGE: Clean your afce and place the device in contact with your skin. Recommended to be used for a total of 16 minutes rotating it over different portions of the face. This should be done at least thrice a week. Bottomline: It is a perfect device for at home therapeutic use. It sets a high standard for its competitors. Justifies the price it demands for the reliability and quality that it provides. A revolutionary product amongst all in its league since it uses the combined effect of ‘red’ and ‘blue’ light for healing your skin. Both these lights are clinically proven to work wonders for skin. When combined, these lights together rejuvenate skin by eliminating wrinkles, acne scars, blemishes, improving collagen production, rendering anti bacterial and anti inflammatory effects on your skin. This makes this hand held device ‘one of its kind’ and a complete package for fighting the most stubborn skin problems! The device contains 42 blue LEDs and 40 red LEDs. Blue light helps to kill acne causing bacteria and red lights coupled with it to oxygenate the skin by enhancing blood circulation and reduce inflammation associated with acne prone skin. The device will shine on your skin, bot red and blue lights. For effective and safe treatment, the device emits blue light for 5 minutes and red light for a span of 7.5 minutes. The breakthrough technology that this device uses will provide clinically proven results. It is an FDA cleared device, and has been recommended by dermatologists. Emits no UV light so completely safe. You avail a five years warranty for the product. Refund assured after use for 90 days, if the product fails to deliver results. USAGE: Hold the device close to your skin and switch it on. A beep will indicate when there is a need to move the device on to a new area on the face. Recommended to be used for 3 to five times a week. Bottomline: A very innovative and promising product while being extremely cost effective too. It outwits all other products and fits in the best purchase among light therapy devices for your skin healing and rejuvenation. Eliminating all traditional topical treatments that trap you in a vicious cycle of reusing them again and again to subside acne, Silk’n Blue Acne Clearing Device claims to provide you with the cure that you’ve been looking for. It is also a hand held device, that uses the healing power of ‘blue light’ to kill the bacteria which are the root cause of acne breakouts. The wavelength of blue light used claims to kill deep seated bacteria and prevent regrowth by drying the oil glands(which they feed on). Mild heating effect causes the oil glands to dry and enhance the treatment effects. Safe, since no UV radiation is emitted and thermoregulatory too. Suitable for adults as well as teenagers. The device has FDA and Health Canada clearance. The voltage adapter with the device works within a range of 100 to 240 volts. You can avail a 2 years warranty for the product. USAGE: Recommended to be used for 3,4 minutes on faec. The frequency of treatment will depend on the gravity of your problem. You may see results within 3 to 7 weeks of usage. Backed with clinical information and real testimonials. Apart from all the facts we have found that positive customer reviews outweigh the negative ones by a good margin. It can be said that this product will be practically delivering desired results! Bottomline: An impressive product that is comparatively low on cost amongst others. Ideal for people who have extra oily skin and thus overgrowth of acne. It is a product worth buying. This device claims to use powerful ‘Blue light’ used by professionals to treat acne prone skin. Tanda Clear Plus not only promises to eliminate acne causing bacteria but promises to be safe and gentle on your skin preventing nay sort of side effects like redness, dryness and irritation. The device has something different to offer. it uses a combination of Blue light, gentle heat and sonic vibrations to kill the root cause of acne that is P. acnes bacteria. It claims to not only help with bacterium but also remove pimples and improve circulation in the blood vessels covering your face to provide better oxygenation . An overall effect of it use would be having a clearer and radiant skin. Clears existing acne and prevent future breakouts and is safe for all skin types. Claims to be a pain free treatment and also eliminate any sort of side effects. A built in sensor turns the device on when it is in close contact with the skin. It is turned off if kept away from the skin for 20 seconds. The device has a rechargeable battery that helps to use the device cordlessly. USAGE: Treat affected areas fr three minutes, at least twice a day. Use on cleansed facial skin. The most striking feature of this device is that it claims to make you feel the difference in 24 hours. It acts fast but does not have any adverse effects. People have reported it to be very mild on the skin. It is the only Blue light therapy device that uses ‘sonic vibrations’! Science says that these are beneficial for improving circulation and thus help in attaining a radiant glow and combat bacterial infection. Bottomline: A high quality, professional grade product which guarantees to give results. It is slightly expensive but its abundant features justify its price. Must buy if you have sensitive skin such that you fear post treatment side effects. 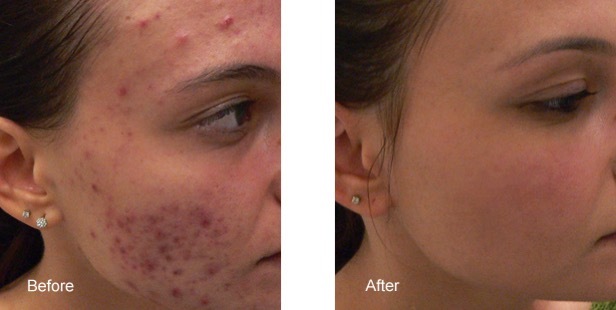 Light Stim is yet another device that uses multi wave technology to treat acne. Combining the therapeutic benefits of red and blue LED lights this device will effectively kill acne causing bacteria as well as reduce inflammation and improve blood circulation in your skin. Light Stim is a medical grade certified device that uses NASA’s LED technology. It is a device recommended by dermatologists and estheticians to deliver professional grade results at home. It uses patented technology that guarantees safety and high quality results. Provides a natural and painless way of healing your skin with certified and patented multi wave technology. Not only addresses the problem at hand but also prevents future infections. Claims to be a maintenance free product. It will not incur any cartridge or battery replacements cost. 90 days money back policy. USAGE: Recommended to be used in close contact with the skin for at least 3 minutes in the affected area. Bottomline: A very reliable and tested product that delivers professional grade results. Norlanya has combined technology and innovation to bring the combined effect of bot at your ease. It has been made primarily to boost collagen and remove acne! It is ideal for skin, not only on the face and neck but also the body. Using multiwave technology, it combines the benefits of blue, red and yellow lights. It allows to switch over from one light to another. It allows you to set the time for treatment with one particular light. Unlike other devices it does not mandate the use of combined effect of lights by operting them simultaneously but it allows the user to use them as and when required. They provide different switches for different colors of light.The most striking feature is that you can even switch on a single light, two lights together, or all three of them. The choice is yours. It even allows you set the treatment time. It combines the use of yellow, red and blue light. Red and Yellow and blue lights are used. This system includes a total of 420 LED lamps. Yellow light (470 nm) : Leads to proper circulation and helps in boosting the immune system. Such that it will prevent the outburst of acne. Blue light (470 nm): The blue light kills the bacteria named as P.Acne or Propionibacterium Acne. With its use the bacteria are removed from the roots thereby stopping any further increase of acne bacteria. Red light (630 nm): Helps in cell regeneration, collagen production, and boosting circulation. Also encourages the repairing process of skin. Highly satisfied customers vouch for its efficiency! USAGE: The combo program is designed for daily skin care. The total length of treatment per session is 10 minutes, with 3 minutes for yellow, the same being for red and 4 minutes for blue. Bottomline: One of its kind product that uses three different wavelengths to replenish and heal your skin. It can be a must buy for thise looking for ‘complete skin care’! This device is another hand held device that exclusively uses ‘blue light’ to kill acne outbursts. The Revive Blue light therapy system claims to penetrate deep into the skin, while conferring the healing properties of ‘blue light’ to you. The anti bacterial properties heal your skin and wipe away the root cause of acne: propionobacterium acnes. Not only this, it is mild on the skin and will help to calm inflammation too. USAGE: The device can be used conveniently on the face, focussing each area for 3 mins, and shuts down automatically after complete 20 minutes of use. This makes yo care free while using it and safe too. The device has been built keeping in view the US standards of Power and Voltage supply. You may need to use a suitable adapter/converter if you’re in another country. Overall rating about the efficiency of the product by the customers is good. The product is also supported by clinical datashowcasing real customer testimonials. Bottomline: A very affordable and reliable product. A simple ‘bulb’ can also be used for your rescue, when it comes to treating your skin with monochromatic lights. The best thing about this is that they use powerful LEDs, such that their number is also quite high. So, overall they exert a good healing effect on your skin. ‘RubyLux’ ble light bulb is one of the popular and often bought product in this category. It may be used to kill bacteria or yeast/fungus on any surface and is not known to be harmful to skin, hair or nails. ‘Antibacterial’, so recommended for treating acne. Small size bulb: Consists of 38 premium intensity LEDs. 1.5 inches in diameter. Large size bulb: Consists of 168 LEDs. A total of 4.75 inches in diameter while the LED surface spans over 4.25 inches. Instructions and safety information are delivered electronically to the customer, after purchase. While they are given along with the product too. Customers have to buy Ruby Lux Goggles seperately, since they are not included with the product. USAGE: This product is to be used with certain precautions. You will have to keep you face away at a manageable distance from the bulb (at least 12 inches). Not recommended to be used for more than 2o minutes and not more than 6 times a week. Customer reviews are rather limited, but no potential hazards or side effects noted. It can be conveniently used while bathing, to save time. Bottomline: A low cost and effective option for treating acne prone skin. The most convenient and easy to use option for a blue light therapy on your face, would be a ‘facial mask’! ‘Neutrogena’ a trusted name in the beauty industry brings forth an LED facial mask that targets acne prone skin. Guaranteed smooth and clear skin. Causes reduction in inflammation and redness. One of the most striking feature about masks is that it can be worn without using goggles.The device is fitted with ear pieces to hold it in place. No adjustments can be made manually to set the time, it is designed for 10 minutes of use. It weighs for about 11 ounces and is reported to be effective and safe, by most of the customers. Bottomline: A very user friendly and safe for blue light therapy option. Cannot be compared with professional grade devices, but this one can be used if your acne problem is less severe and you don’t need too many repeated treatment sittings. Blue light helps to heal and clear the skin by reducing acne causing bacteria and heal redness and inflammation. Angel Kiss mask smoothens and brightens the skin conferring all benefits of blu light therapy to your skin. Comparing it by weight from, other suggested brands we find that it is slightly heavier. The mask comes with an elastic strap to keep the mask in place even while you tilt a little.The remote control enables you to set the treatment time. There is no mention of any refund policy whatsoever. Bottom line: Very affordable yet a quality product. Trusted and used by many. It can also be a wise purchase.